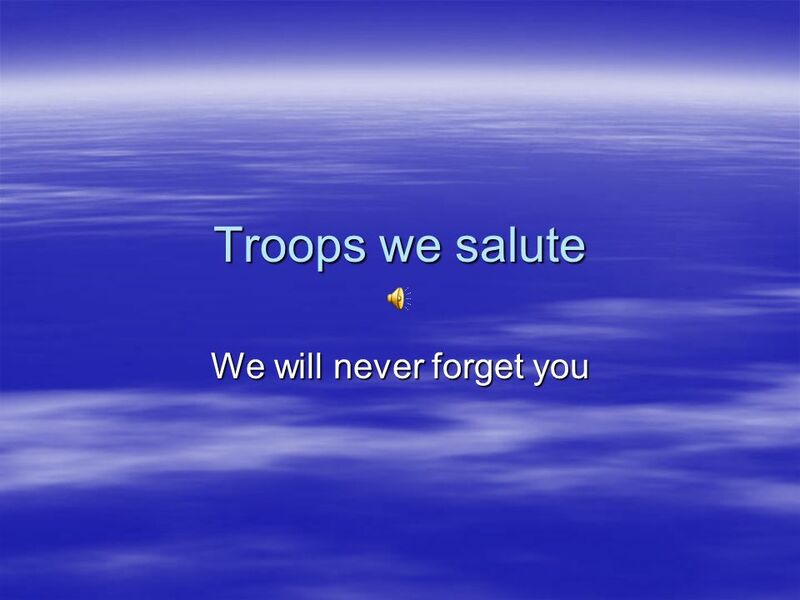 Troops we salute We will never forget you 9-11 9-11 was the most horrible day in history because we were attacked about 2 or 3 planes were hijacked and. 13 Civil war cont. General Ulysses.S.Grant was the northern general. General Ulysses.S.Grant was the northern general. He was probably the best you could find because the north won the civil war. He was probably the best you could find because the north won the civil war. 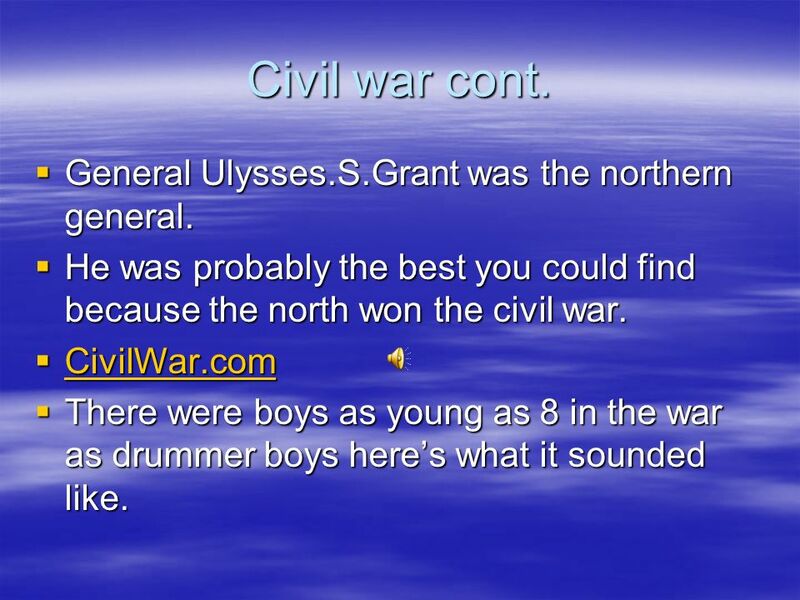 CivilWar.com CivilWar.com CivilWar.com There were boys as young as 8 in the war as drummer boys heres what it sounded like. There were boys as young as 8 in the war as drummer boys heres what it sounded like. 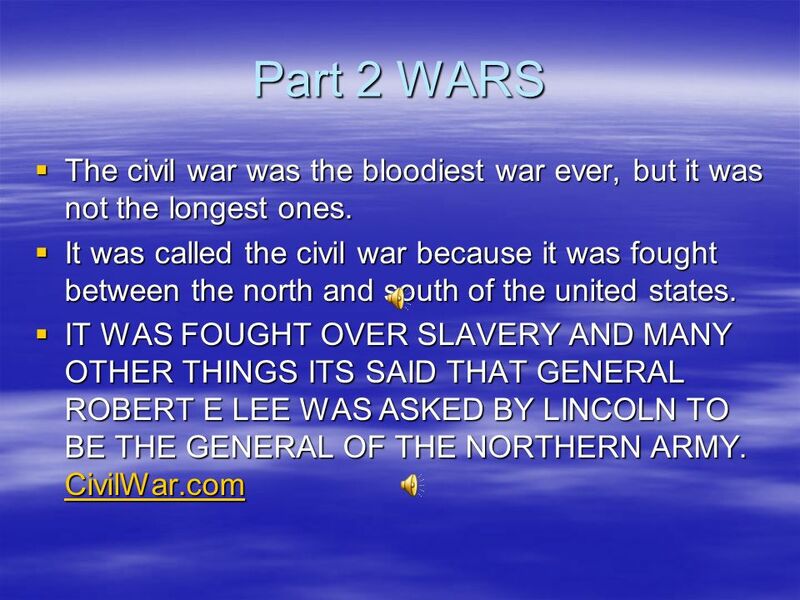 14 Civil war cont. 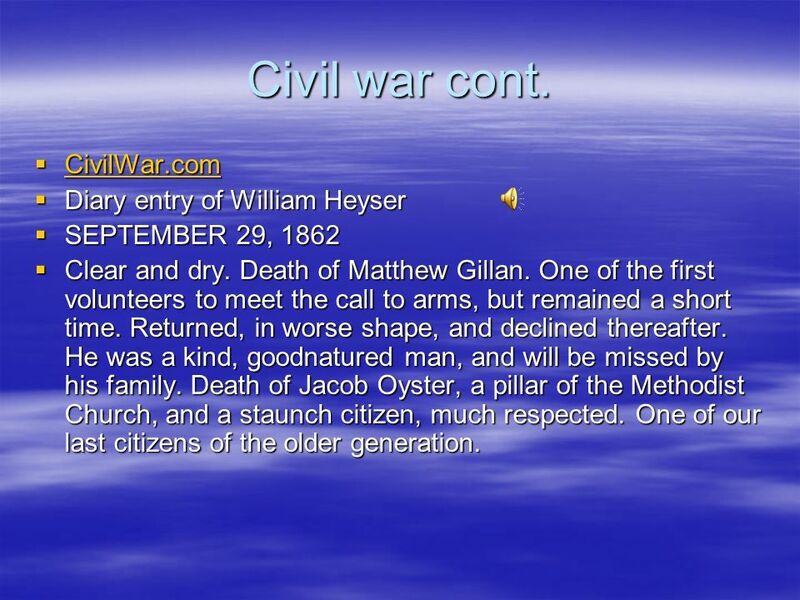 CivilWar.com CivilWar.com CivilWar.com Diary entry of William Heyser Diary entry of William Heyser SEPTEMBER 29, 1862 SEPTEMBER 29, 1862 Clear and dry. Death of Matthew Gillan. One of the first volunteers to meet the call to arms, but remained a short time. Returned, in worse shape, and declined thereafter. He was a kind, goodnatured man, and will be missed by his family. Death of Jacob Oyster, a pillar of the Methodist Church, and a staunch citizen, much respected. One of our last citizens of the older generation. Clear and dry. Death of Matthew Gillan. One of the first volunteers to meet the call to arms, but remained a short time. Returned, in worse shape, and declined thereafter. He was a kind, goodnatured man, and will be missed by his family. Death of Jacob Oyster, a pillar of the Methodist Church, and a staunch citizen, much respected. One of our last citizens of the older generation. 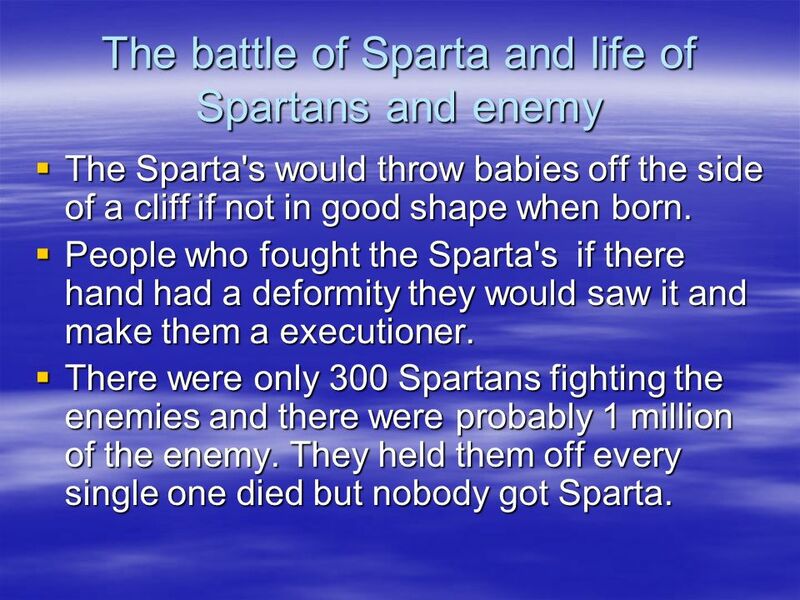 15 The battle of Sparta and life of Spartans and enemy The Sparta's would throw babies off the side of a cliff if not in good shape when born. The Sparta's would throw babies off the side of a cliff if not in good shape when born. People who fought the Sparta's if there hand had a deformity they would saw it and make them a executioner. People who fought the Sparta's if there hand had a deformity they would saw it and make them a executioner. There were only 300 Spartans fighting the enemies and there were probably 1 million of the enemy. They held them off every single one died but nobody got Sparta. 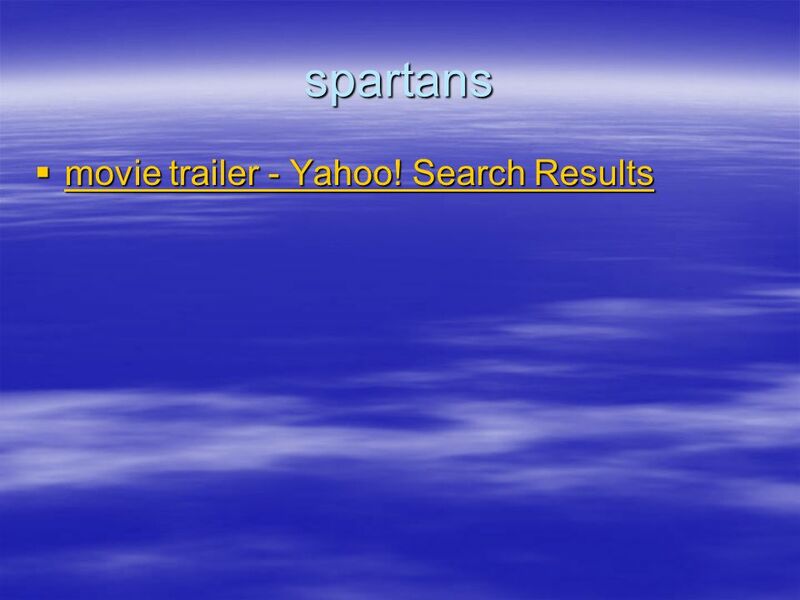 There were only 300 Spartans fighting the enemies and there were probably 1 million of the enemy. They held them off every single one died but nobody got Sparta. 17 World war one In the summer of 1914 the Germans were prepared, at the very least, to run the risk of causing a large-scale war. The crumbling Austro- Hungarian Empire decided, after the assassination on 28 June, to take action against Serbia, which was suspected of being behind the murder. The German government issued the so-called 'blank cheque' on 5-6 July, offering unconditional support to the Austrians, despite the risk of war with Russia. Germany, painted into a diplomatic corner by Wilhelm's bellicosity, saw this as a way of breaking up the Entente, for France and Britain might refuse to support Russia. Moreover, a wish to unite the nation behind the government may have been a motive. So might desire to strike against Russia before it had finished rebuilding its military strength after its defeat by Japan in 1905. In the summer of 1914 the Germans were prepared, at the very least, to run the risk of causing a large-scale war. The crumbling Austro- Hungarian Empire decided, after the assassination on 28 June, to take action against Serbia, which was suspected of being behind the murder. The German government issued the so-called 'blank cheque' on 5-6 July, offering unconditional support to the Austrians, despite the risk of war with Russia. Germany, painted into a diplomatic corner by Wilhelm's bellicosity, saw this as a way of breaking up the Entente, for France and Britain might refuse to support Russia. Moreover, a wish to unite the nation behind the government may have been a motive. So might desire to strike against Russia before it had finished rebuilding its military strength after its defeat by Japan in 1905. 18 Ww1 A month after the war began, Germany drew up some far-reaching war aims. French power would be broken, Belgium reduced to vassal status, and a colonial empire carved out in Africa and elsewhere. Mitteleuropa, a German-dominated customs union, would give Berlin economic hegemony. As the war went on, Germany's appetite grew. In 1917-18 Germany set up a huge informal empire on the ruins of defeated Russia. There were distinct continuities with Hitler's aims in World War Two. A month after the war began, Germany drew up some far-reaching war aims. French power would be broken, Belgium reduced to vassal status, and a colonial empire carved out in Africa and elsewhere. Mitteleuropa, a German-dominated customs union, would give Berlin economic hegemony. As the war went on, Germany's appetite grew. In 1917-18 Germany set up a huge informal empire on the ruins of defeated Russia. There were distinct continuities with Hitler's aims in World War Two. 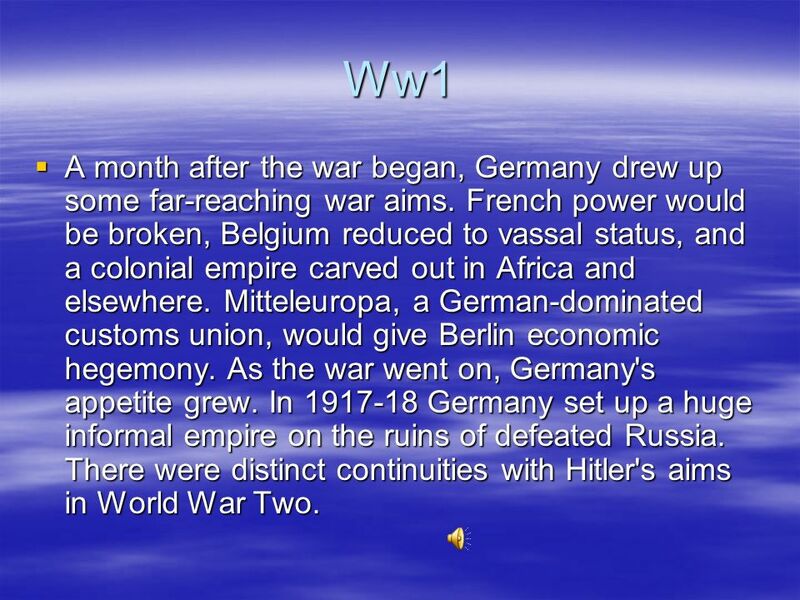 21 World war 2 World war 2 was started when Germany attacked Poland in the year of 1939. World war 2 was started when Germany attacked Poland in the year of 1939. Hitler was the dictator of Germany before world war 2 started. 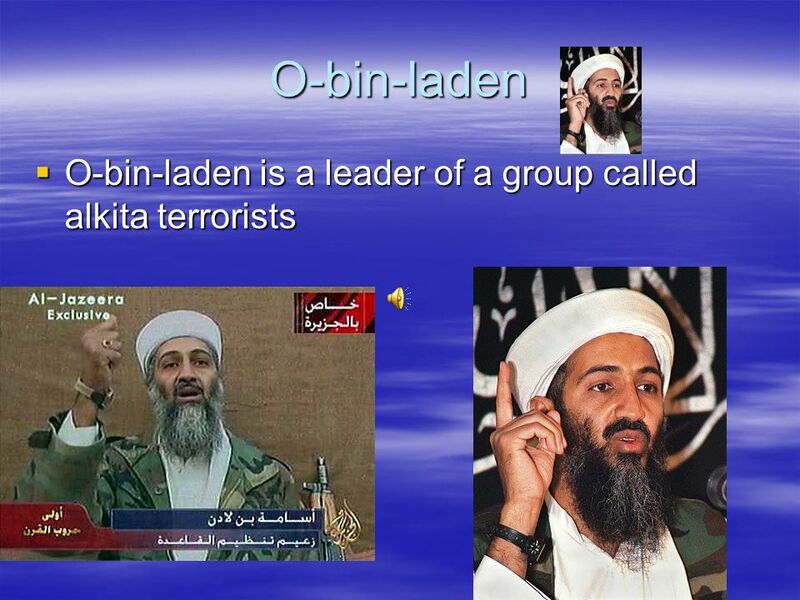 He hated Jews thats where the holocaust comes in. Hitler was the dictator of Germany before world war 2 started. He hated Jews thats where the holocaust comes in. 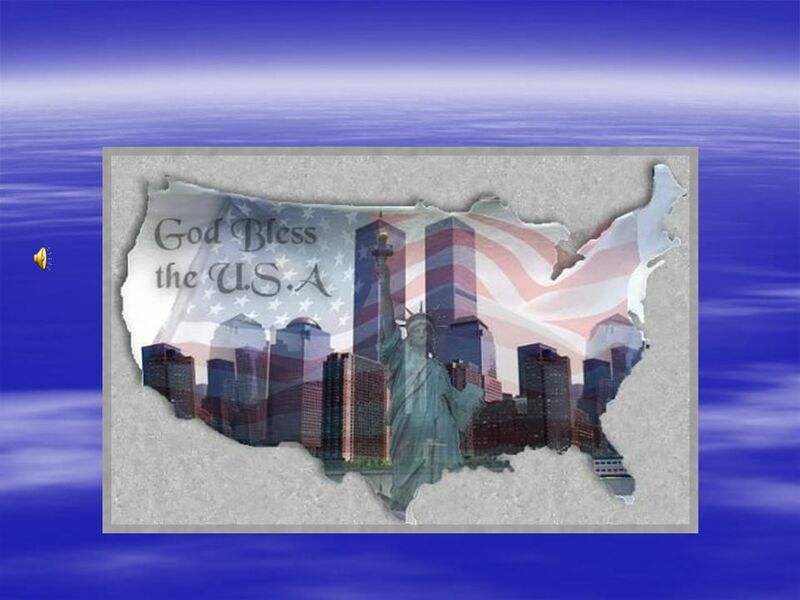 World war 2 was started for America when the Japanese attacked Pearl Harbor in Hawaii. 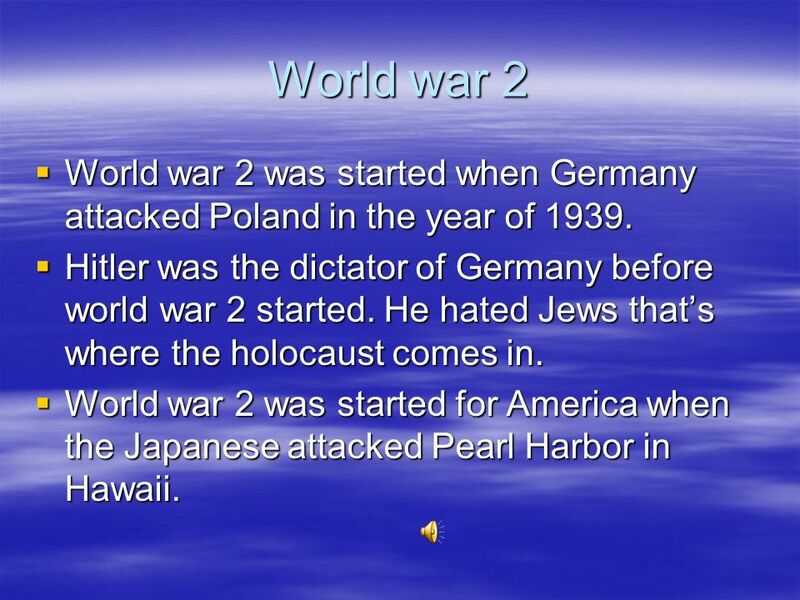 World war 2 was started for America when the Japanese attacked Pearl Harbor in Hawaii. 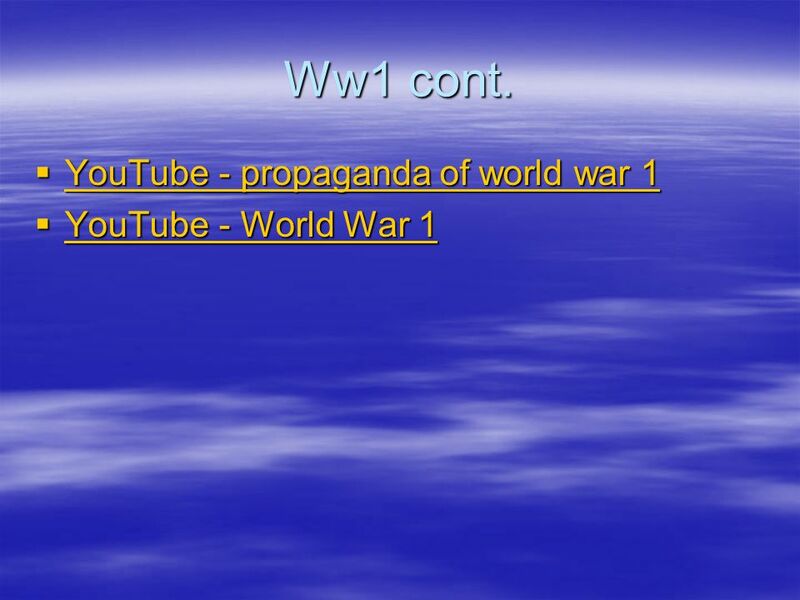 22 World war 2 cont. Heres a clip from Saving Private Ryan. Heres a clip from Saving Private Ryan. 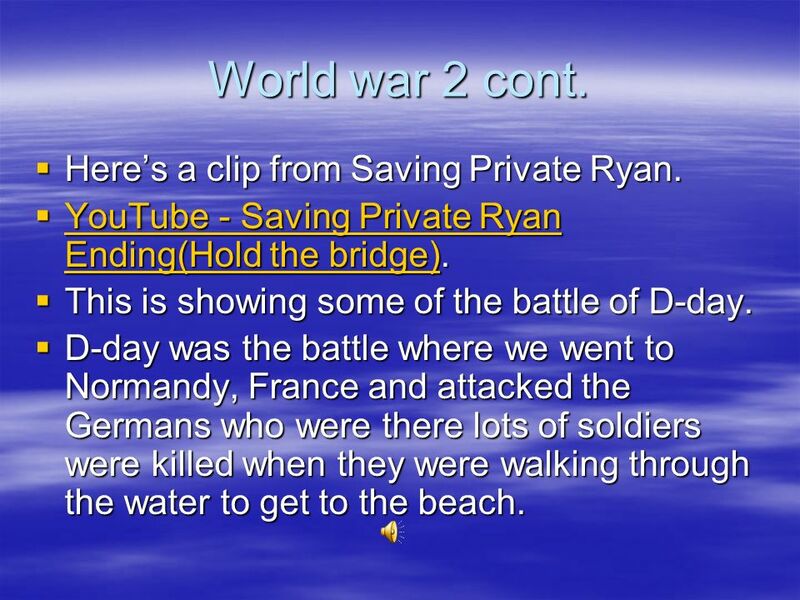 YouTube - Saving Private Ryan Ending(Hold the bridge). YouTube - Saving Private Ryan Ending(Hold the bridge). YouTube - Saving Private Ryan Ending(Hold the bridge) YouTube - Saving Private Ryan Ending(Hold the bridge) This is showing some of the battle of D-day. 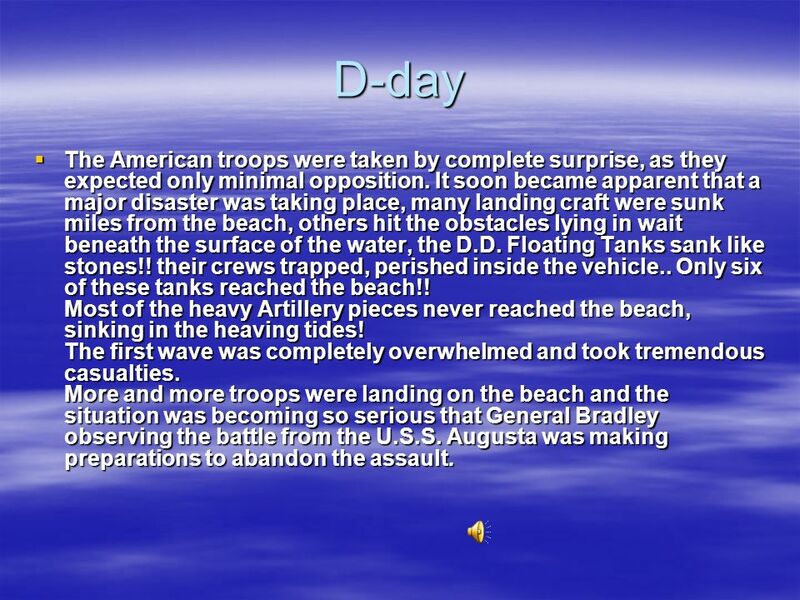 This is showing some of the battle of D-day. D-day was the battle where we went to Normandy, France and attacked the Germans who were there lots of soldiers were killed when they were walking through the water to get to the beach. D-day was the battle where we went to Normandy, France and attacked the Germans who were there lots of soldiers were killed when they were walking through the water to get to the beach. 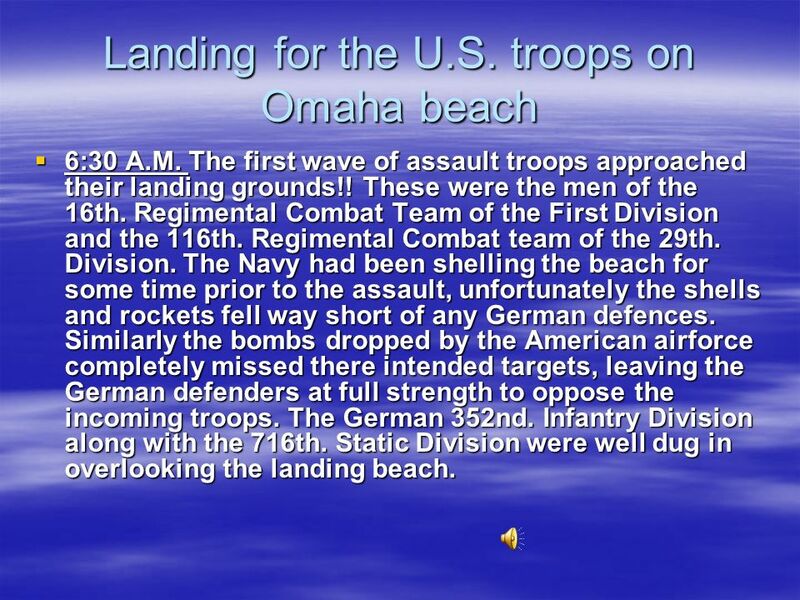 24 Landing for the U.S. troops on Omaha beach 6:30 A.M. The first wave of assault troops approached their landing grounds!! These were the men of the 16th. Regimental Combat Team of the First Division and the 116th. Regimental Combat team of the 29th. Division. The Navy had been shelling the beach for some time prior to the assault, unfortunately the shells and rockets fell way short of any German defences. 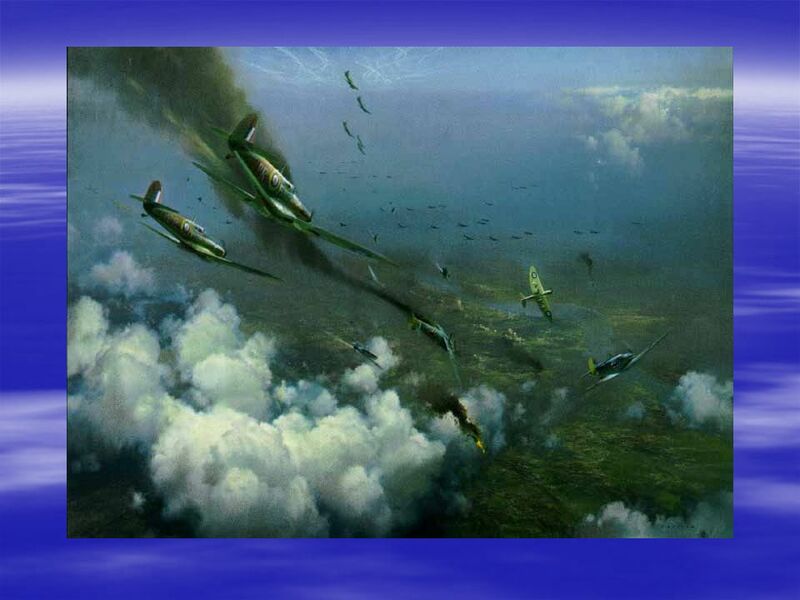 Similarly the bombs dropped by the American airforce completely missed there intended targets, leaving the German defenders at full strength to oppose the incoming troops. The German 352nd. Infantry Division along with the 716th. Static Division were well dug in overlooking the landing beach. 6:30 A.M. The first wave of assault troops approached their landing grounds!! These were the men of the 16th. Regimental Combat Team of the First Division and the 116th. Regimental Combat team of the 29th. Division. The Navy had been shelling the beach for some time prior to the assault, unfortunately the shells and rockets fell way short of any German defences. Similarly the bombs dropped by the American airforce completely missed there intended targets, leaving the German defenders at full strength to oppose the incoming troops. The German 352nd. Infantry Division along with the 716th. Static Division were well dug in overlooking the landing beach. 25 D-day The American troops were taken by complete surprise, as they expected only minimal opposition. It soon became apparent that a major disaster was taking place, many landing craft were sunk miles from the beach, others hit the obstacles lying in wait beneath the surface of the water, the D.D. Floating Tanks sank like stones!! their crews trapped, perished inside the vehicle.. Only six of these tanks reached the beach!! 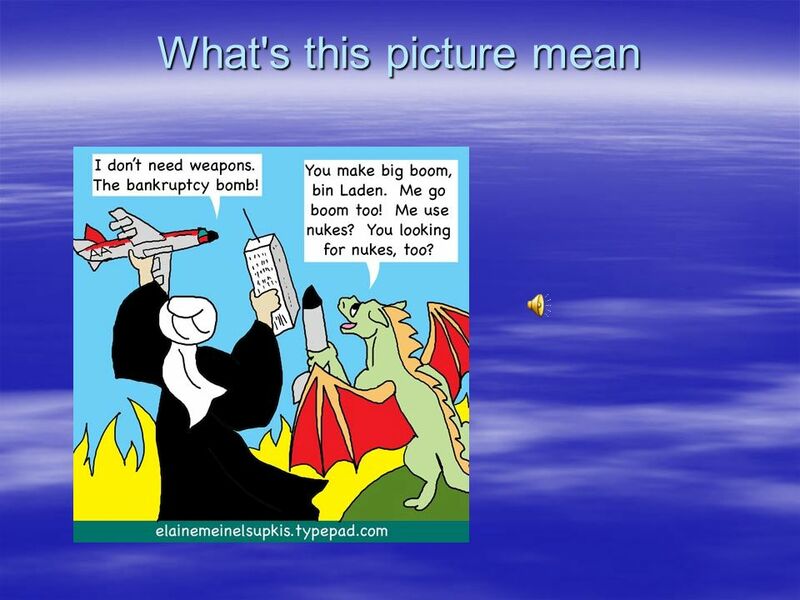 Most of the heavy Artillery pieces never reached the beach, sinking in the heaving tides! 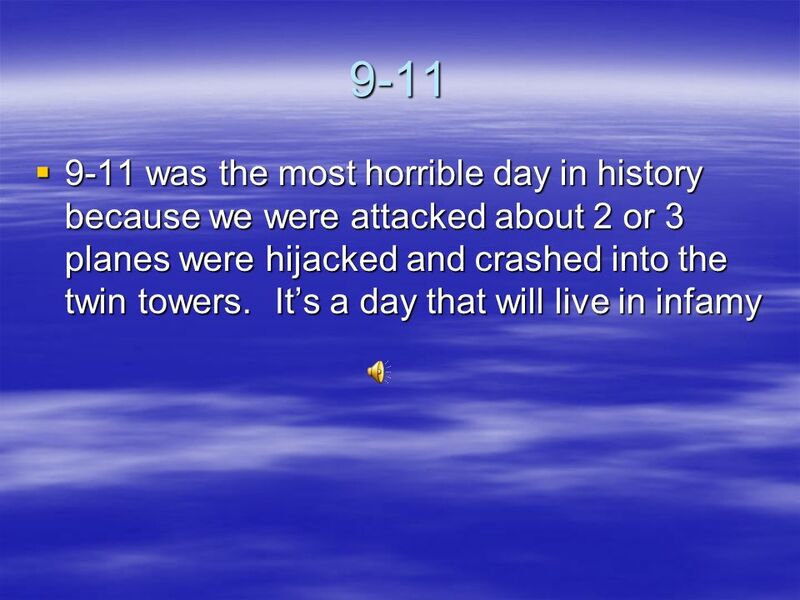 The first wave was completely overwhelmed and took tremendous casualties. More and more troops were landing on the beach and the situation was becoming so serious that General Bradley observing the battle from the U.S.S. Augusta was making preparations to abandon the assault. 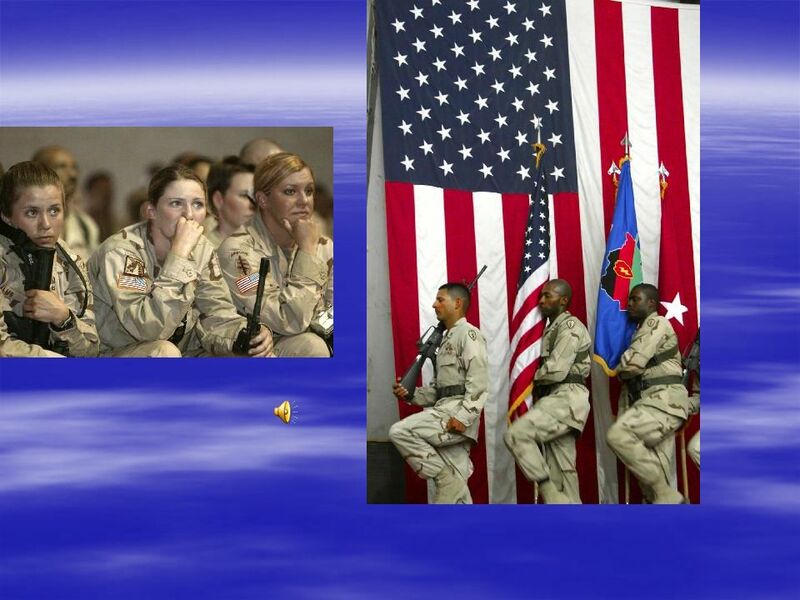 The American troops were taken by complete surprise, as they expected only minimal opposition. It soon became apparent that a major disaster was taking place, many landing craft were sunk miles from the beach, others hit the obstacles lying in wait beneath the surface of the water, the D.D. 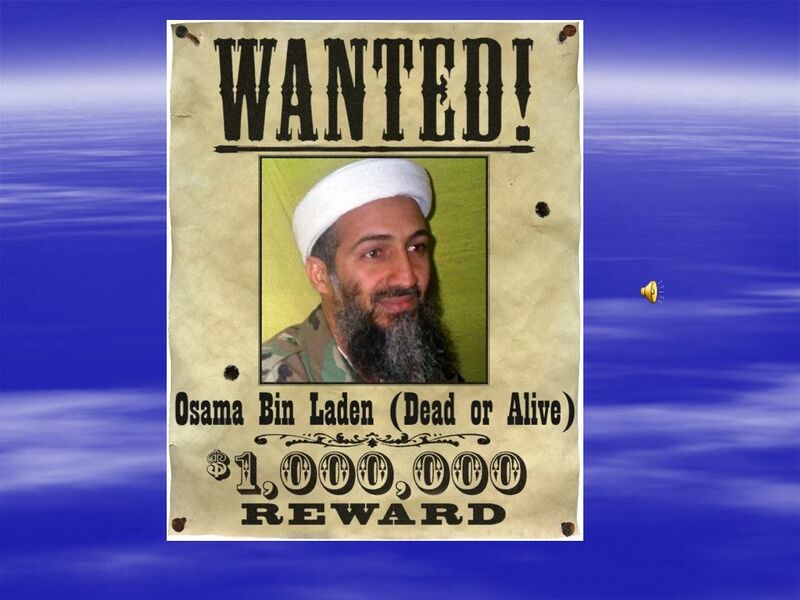 Floating Tanks sank like stones!! their crews trapped, perished inside the vehicle.. Only six of these tanks reached the beach!! Most of the heavy Artillery pieces never reached the beach, sinking in the heaving tides! The first wave was completely overwhelmed and took tremendous casualties. More and more troops were landing on the beach and the situation was becoming so serious that General Bradley observing the battle from the U.S.S. Augusta was making preparations to abandon the assault. 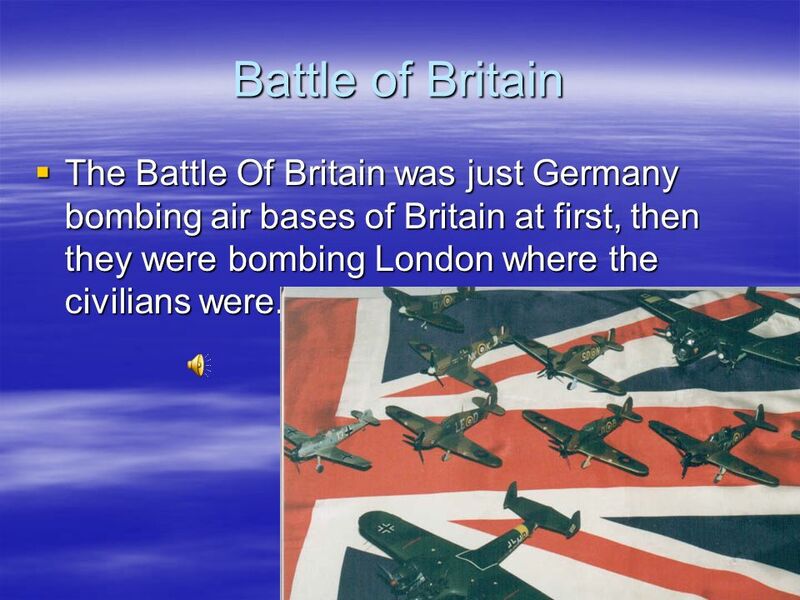 26 Battle of Britain The Battle Of Britain was just Germany bombing air bases of Britain at first, then they were bombing London where the civilians were. The Battle Of Britain was just Germany bombing air bases of Britain at first, then they were bombing London where the civilians were. 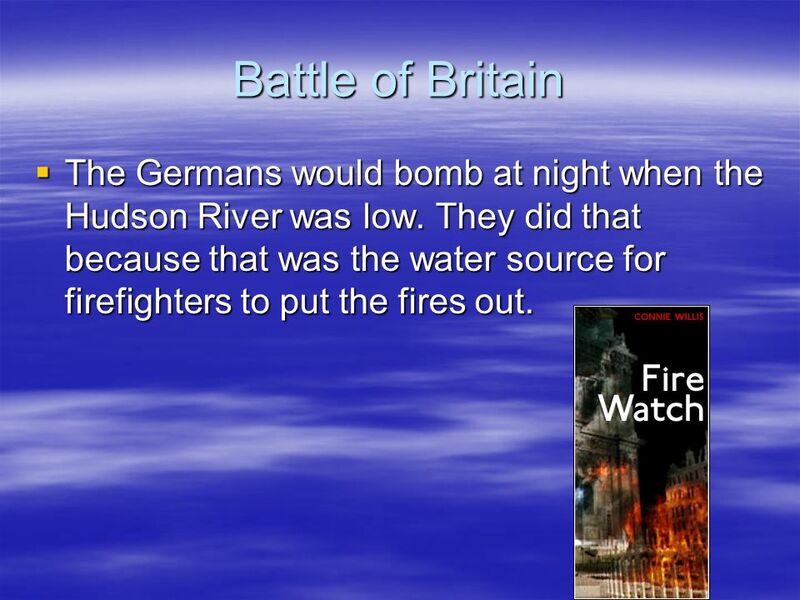 28 Battle of Britain The Germans would bomb at night when the Hudson River was low. They did that because that was the water source for firefighters to put the fires out. The Germans would bomb at night when the Hudson River was low. They did that because that was the water source for firefighters to put the fires out. 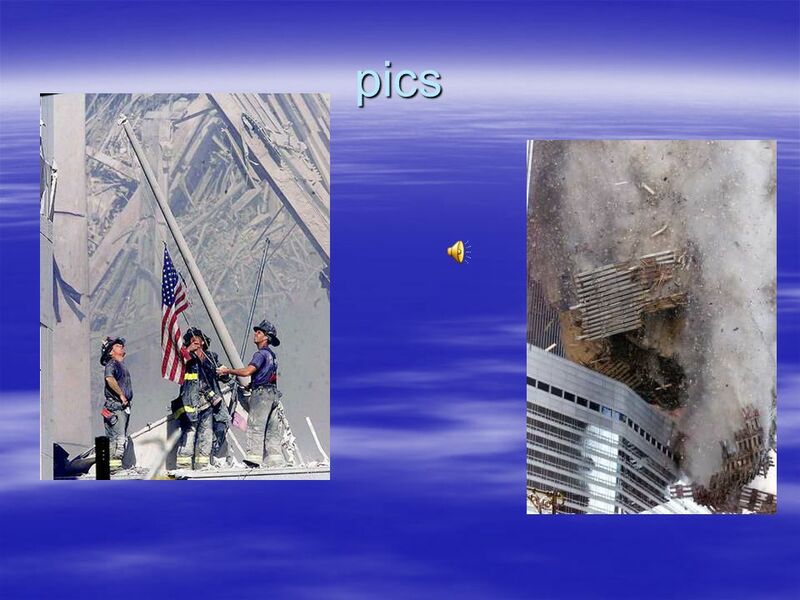 Download ppt "Troops we salute We will never forget you 9-11 9-11 was the most horrible day in history because we were attacked about 2 or 3 planes were hijacked and." 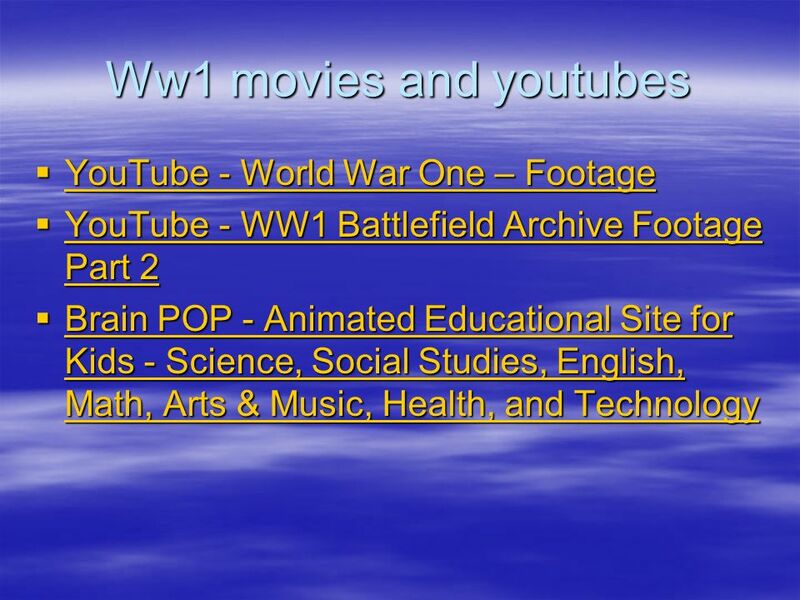 World War II By: Aaron Reavis 1 st period Coach Bare. Victory in Europe and the Pacific. 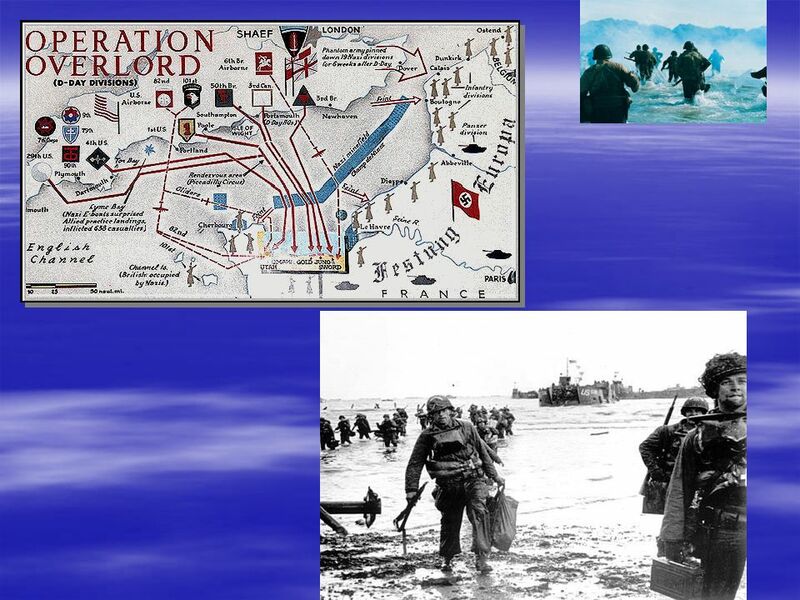 Why it Matters  In 1942 and 1943 the Allies turned back Axis advances  In 1944 and 1945 they attacked Germany from. World War II The War in Europe Mr. Herneisen. 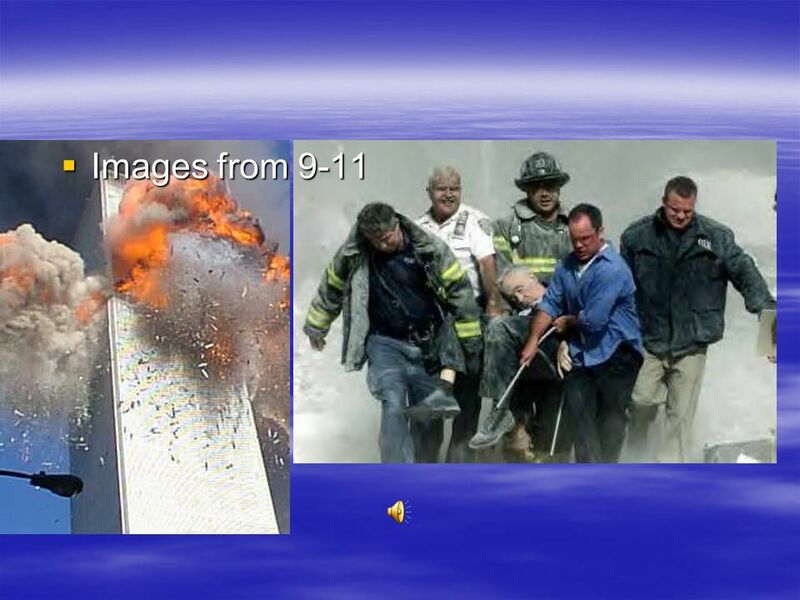 Background – World War I  Germany & Ottoman Empire (Turkey) vs. USA, Great Britain, France  Germany loses. War in the Pacific.  Phase 1: September 1939 to June 1940 “Phony war” – when little happened in Western Europe after Germany invaded Poland. 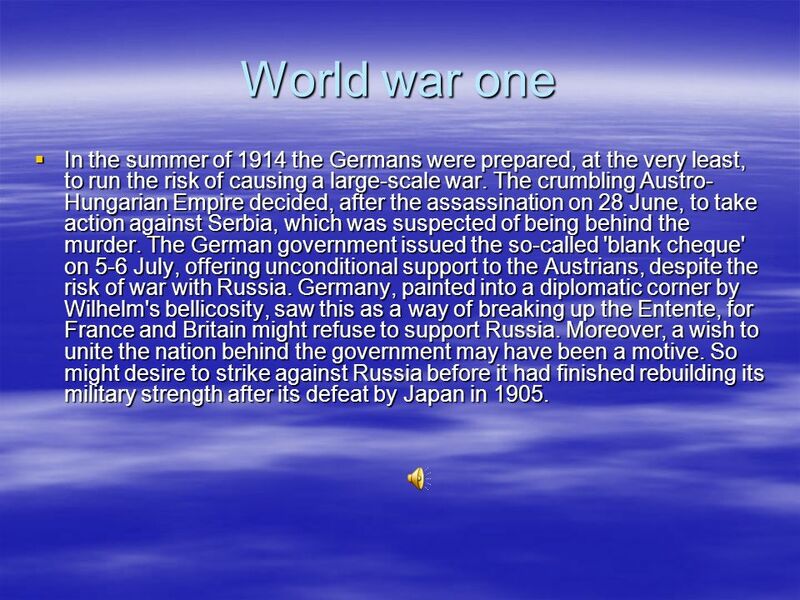 Chapter 16: World War II Main Ideas: 1)Germany, Italy, and Japan tried to build empires. 2) Developments in science and technology changed the. The War in Europe The people of Germany were struggling; they were humiliated that they lost WWI and the economy was bad. Hitler promised he would bring. Session: Nazi Germany & World war II 1939 Nazi Propaganda Poster Image Source: Nazi Soldiers.